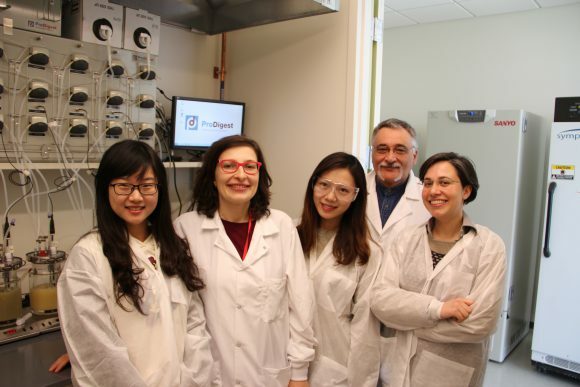 Share the post "The Center for Digestive Health of the New Jersey Institute for Food, Nutrition, and Health at Rutgers University and ProDigest (Belgium) Join Forces to Advance Digestive Health Research"
L-R: Man Zhang, graduate student; Mary Falduto, IFNH postdoc associate; Ting Zheng, graduate student; prof. Michael Chikindas, director of the IFNH Center for Digestive Health; and Dr. Beatriz Guimaraes, ProDigest, in the IFNH laboratory. The New Jersey Institute for Food, Nutrition, and Health (IFNH) and ProDigest, a company that develops unique laboratory models of the complete gastrointestinal tract of humans and animals in Belgium, announced a new strategic collaboration in the area of “digestive health.” As part of this collaboration, ProDigest’s Simulator of Human Intestinal Microbial Ecosystem (SHIME®) was recently installed in the IFNH’s modern research facility on the George H. Cook Campus at Rutgers. The SHIME® is a sophisticated new technological platform for studying microbial, physical and chemical processes in the gastrointestinal (GI) tract. Under controlled conditions, the system simulates the full GI tract, including stomach, small intestine and large intestine (i.e. ascending, transverse, descending colon). A highly versatile computer-operated system, SHIME® also allows researchers to conveniently withdraw samples for targeted analysis. The SHIME® system, which can be configured to model the GI tract of the human body from infancy to adulthood, will enable basic research into GI biology, physiology and digestive disorders. Such enabling technology accelerates translational research from the bench to the clinic and beyond, making it an important acquisition for Rutgers, explained George Carman, chief scientific officer at the IFNH and distinguished professor in the Department of Food Science. “The SHIME® system will expand our food and nutritional science research capabilities here at Rutgers and offer our students unique learning opportunities,” added Carman.